I'm interested in checking out the multiplayer. England, definitely. I'm really interested in trying out the new trade system with a maritime country. After that, perhaps Muscovy, if I'm in a masochistic mood - each of my 3-4 Muscovy attempts in EU3 went down in flames. The best game I ever had was as Burgundy. I managed to reduce France to a handful of provinces and colonize most of the Atlantic coast of North America and large chunks of the rest of the New World before my BB score made it impossible to stay out of wars. So I plan on playing as them for my inaugural game. Burgundy is one of my favorites. For some reason I like destroying France. Paradox announced this morning that pre-ordering EUIV will also score you an official save converter so you can convert your Crusader Kings II games to play in EUIV. They'll be doing a live stream today to show how it works. Paradox is doing dev diaries every day this week and beta AARs next week, ramping up to release. From a PCGamer interview: "importing a game with the CK2 Sunset Invasion DLC will spawn a huge Aztec Empire in North America." As ahistorical as it might be, I'm going to have to try that at some point! With the news of the converter coming for preorders, my decision is already made: I'll be importing my ongoing Hispania game from CK2 to EU4. Heh heh @ wanderingtaoist's image. Me too! Hope they release Victoria 2, etc converters at some point; I'd be interested in trying a Paradox mega-campaign all the way from the Dark Ages through to the modern day. I don't know if you have seen this, but I just got bit by the EU4 bug and a friend pointed me at this EU3 vs EU4 page from Paradox. EDIT: And I updated the OP with some links and information for those just checking out the thread. 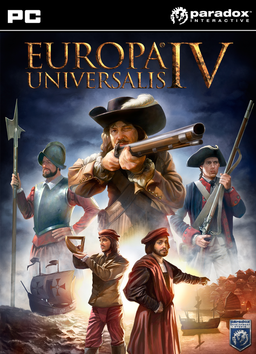 I've never played a Europa Universalis game before, but after getting into CK2 and playing the demo of EU4, I've decided to jump in and pre-order. Looking forward to attempting to figure this game out! So I've played a bit of the demo, and for the most part I am liking what I am seeing. This is good since I preordered the game quite awhile ago. The new interface is going to take awhile to get used to, but the one thing that is really bothering me so far is the audio. Specifically, EU3 had a lot of audio cues that helped me play. I didn't even notice how much they helped until they were gone. Specifically, there was a loud thud if you tried to move a unit somewhere they couldn't go. There was a nice clinking of coins signifying the beginning of a new month. There was an audible "whoosh" when your navy accepted a command. These are small things, but they were nice to have around. Odd. I played a bit of the demo this morning and definitely heard plenty of those audio cues. At least I thought I did. Installed the demo and started it up and immediately felt like a drooling idiot. It's been way too long since I played EU. I need an EU4 let's play! I'm going to try to figure out what I can on my own. EDIT: I feel like an idiot. The cues are all still there they just weren't playing properly. Having Steam "verify the integrity of the demo cache" fixed the problem. So I started it back up to check out the sound cues again. Selecting a unit sometimes gives me one. The tech pop-up and stability gain message both give me cues. The monthly taxes properly show up as green numbers each month, but no sound. Still no sound for the navy. Weird. Hopefully, it is just an odd sound bug in the demo build. EDIT: I feel like an idiot. The cues are all still there they just weren't playing properly. Having Steam "verify the integrity of the demo cache" fixed the problem. Big thanks to B Dog for letting me know that they were working for him, and it was an issue with me and not the demo. Glad you got that sorted out. I was just about to post that I played a bit more and was definitely hearing all the expected audio cues -- including the very reassuring monthly ca-ching of ducats. Goal for the weekend is to start from the beginning of the dev diaries and see if I can roll through the whole lot of 44. They're the best way to hit the ground running for new Paradox games once you're familiar with the framework in my experience. Also, Steam Workshop support announced. Very cool! Spent a few hours playing the demo last night and so far, I like it! My first game as Venice... uh... did not go well. Note to self: before I declare war on a one-province minor, check whether it is allied with Austria. (At least it's not just me - there's a 3-page thread on the Paradox forum named "Played as Venice and was roflstomped!") Portugal went much more smoothly; I had a toehold in the Caribbean and was carving out a nice little empire in southern India when the demo ended. While I found the graphical and interface improvements welcome, and I'm really glad we no longer clickspam diplomats, etc all over the place, where the game really shone was in forcing me to make hard choices. I never had enough monarch points to do everything, and hiring advisors to boost monarch points was not cheap. Really looking forward to the full version! My impressions after 9 hours of game time in the demo are that this game rocks. The UI is their best yet. The trade system is a vast improvement over EU3 and actually feels more like an important part of gameplay now. Everything looks amazing. At first blush, the AI even seems more competent. First thing, I wanted to give a quick heads up that you can now get really screwed in a peace deal if you are not the war leader and your alliance loses a war. At first I thought it was a bug. I was Portugal which starts the game allied with England. They immediately called me to arms against France. Thinking in EU3 terms I just said sure I'll join to keep you happy, but I doubt I'll fight France much outside of a few naval engagements. So the game goes on, and I had taken part of Morocco in a small side war (which is one of Portugal's missions in the demo). Years go by and suddenly my Moroccan provinces all revert back to Morocco with no popup or messaging. So I start digging in the log and discover that the switch corresponded with England's peace date with France. Just like a human player can force the AI to release nations or return provinces to their core owners, the AI will now do the same to weaken beaten foes and their allies. Long story short, I allied with England who was the war leader. France crushed them in the war on the continent. In the peace deal France grabbed England's European holdings but also used their extra warscore to weaken England's allies including me by making me release my Moroccan-cored lands back to Morocco. Three morals of the story: 1) Make your enemies release cores they may hold in your territory as often as possible (I believe this also lowers your coring cost). 2) If you think your alliance is losing a war and you are not the war leader be sure to uncheck the box in the warscore screen that allows the war leader to negotiate on your behalf. 3) Make sure to adjust all your messaging options when you start the game so you realize what the hell happened in the above scenario and aren't baffled for 20 minutes thinking it was a crazy bug. On messaging options, if you are a new player I think the best thing to do will beto turn every damn one of them on to pop-up and pause when you first start the game. Then as things pop-up in the first few years you can just click the message and deprioritize the message types you don't care about so they never bother you again. It will slow the game down a bit in the beginning, but will also insure you know exactly what you are and aren't being notified about. I really like that the mission system now gives you three directions to choose from. I think I like the new points system. However, administrative points really seem like they will be the tightest bottleneck of the three types. You can expand and core new territory fairly quickly, but you also will need admin points for stability, to unlock idea groups, to build some buildings, and to research government tech. So if you spend too many points on dealing with stability and expansion/overextension you'll likely fall behind quickly either in a available idea groups or government tech. Another big change from EU3 that becomes apparent in the first few months are your advisors. They are almost as important for the extra monarchy points they produce as they are for their specific benefits. They also can be very expensive to keep around compared to EU3. In EU3 you almost always wanted the highest level advisor of a particular type and could use culture to generate said super advisors. In EU4 I don't think there is a way to generate or attract specific advisors AND you would quickly bankrupt yourself paying for them if you hired them. At the beginning of an EU4 game your first impulse will be to immediately fill all three advisor slots with higher levels advisors like in EU3, but this looks to be the road to quick financial ruin. EDIT: One change I am not a fan of is the fact that they've made missionaries' success predictable down to the day. I understand that the wild random swings of conversion success in EU3 weren't the best (sometimes almost instant, sometimes took years and years). However, I think a middle ground would be better. Something like the way sieges now work would be great for the missionaries as well. i.e. zero chance for a period of time followed by a growing percent chance as time goes by. I was in the middle of a four hour session this morning, things were going pretty good, I was helping my allies and getting some coin from blockades, and starting some colonies. My dog wanted to go for a walk so I went to save the game and... DAMN! 2 days and 16 hours until I can save my game! So it should open up around 9am Eastern, is that right? Supposedly. We shall see if the boys at Valve can be arsed to wake up a little early to get this released. Since Steam is the delivery platform and Paradox has said it will go live at 3PM CEST, I assume they will. But, having something up on Steam before 10AM PST would be unprecedented, I think. <---- Is going down the rabbit-hole on this one. It didn't help that I got a hold on CK II as a bonus. edit: Hmmm. This looks like it will play nicely on my laptop. Maybe I come out ahead on this one. Sweet! Impulse buys usually bite me in the arse!